Posted on August 15, 2017 by revivewa	in Travel and Spirituality, Uncategorized and tagged 1. It was with a sense of excitement that three Western Australians travelled to Adelaide to attend the inaugural Uniting Church National History Conference from 9–12 June 2017. With Sheena Hesse, Archivist at the Uniting Church WA, Rev Dr Alison and Robin Longworth joined the fifty or so archivists and historians at Pilgrim Uniting Church. The Conference was hosted by the South Australian Uniting Church Historical Society and focused on the history of the Uniting Church in this 40th anniversary year. 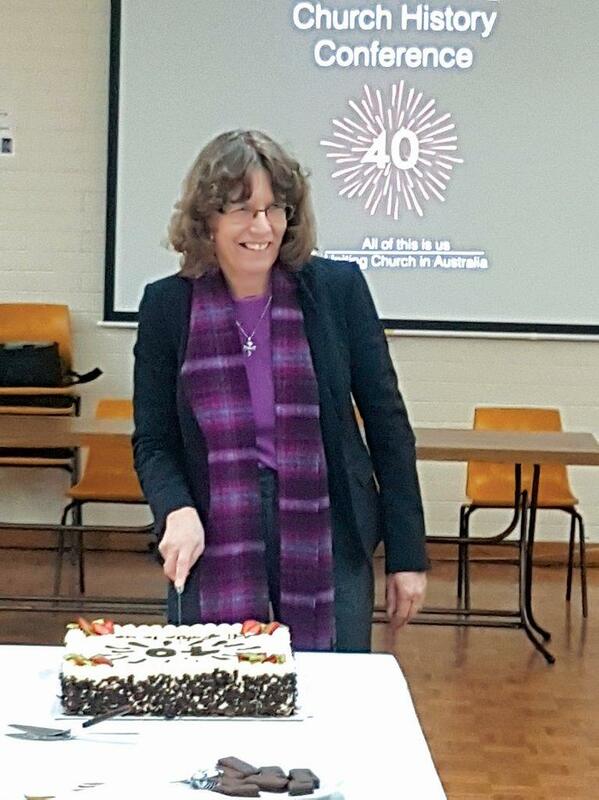 President Elect, Dr Deidre Palmer cuts the 40th anniversary cake at the inaugural Uniting Church National History Conference. The paper looked at the ecumenical influences in the formation of the Uniting Church and how these have proceeded since then. Renate argued that it is time to renew the theological debate on ecumenism, given the challenges within multicultural Australia. Her stimulating address prompted some lively discussion. A total of sixteen papers were presented and covered issues including the formation of The Basis of Union, Urban Mission, the Diaconate and the role of former missionaries in the Uniting Church. At a congregational level, topics ranged from ‘Surviving against the odds’, LGBTIQ issues, and a Western Australian example of change and renewal at Uniting Church in the City, Wesley Perth. On the Saturday evening, the format was a Q & A forum on ‘The Church in the Public Square.’ Panellists were Pastor Mark Kickett, a Nyungar man serving as Development Officer with the Uniting Aboriginal and Islander Christian Congress in South Australia; Past President of the Uniting Church in Australia, Rev Prof Andrew Dutney; President Elect Dr Deidre Palmer; Rev Dr Dean Eland (bringing his experience in urban ministry) and Rev Prof the Hon Brian Howe, former Deputy Prime Minister of Australia. Sunday evening was the highlight of the conference with the launch of the Uniting Church National Historical Society by Stuart McMillan, coinciding with a celebration of the 40th anniversary of the Uniting Church. Drawing on imagery from the North-East Arnhem Land Yolngu Clan, Stuart urged: “Let us return to the white ash of the fire.” He was calling for a return to the stories handed down from one people to the next. Affirming the importance of remembering our history, he declared that as we call on the wisdom of the Spirit in past generations, the ash will burst into new life. With these inspirational words, the Society was launched and of course celebrated with a birthday cake. The Conference concluded on Monday morning with worship followed by the first meeting of the new society. Seven members were elected onto the board. It is anticipated the next conference will be held in Melbourne in 2019. The papers presented at the Inaugural Conference will be published in the forthcoming first edition of the journal of the Society. For further information or enquiry about membership of the Society please contact Rev Dr Alison Longworth at longw@iinet.net.au. Top image: Left to right Dr Jenny Bars, Sheena Hesse, Margaret Reeson ,Christine Gordon, Rosalyn Henry, Anna Lagos at the Mortlock Wing of South Australian State Library.